Gary Sinise Bio, Net Worth, Wife, How Tall is He, Was He in The Military? Gary Sinise may not go down as the popular mainstream actor beloved by a majority of the movie or television viewing public, but he will go down as a generous man who has dedicated his life and resources to helping military veterans. Above any accolade of Oscar wins or Box Office excellence is a pride in knowing you used what you had to improve the lives of those around you. As to the profession that made him a famous man of means, Gary Sinise is a notable actor who has appeared in some iconic films in Hollywood history. He has to his name, an Academy Award nomination, a Golden Globe Award, an Emmy Award and a star on the Hollywood Walk of Fame in recognition of his contributions to Television. Gary Sinise’s eventful life began in Blue Island, Illinois on the 17th of March, 1955 when the actor was born to Robert L. Sinise and Mylles Sinise who are both of Italian descent. He began his journey to success at Glenbard West High School and Highland Park High School which he graduated from before moving on to Illinois State University. While in the University, Gary Sinise, who was born Gary Alan Sinise, along with his two friends, Terry Kinney, and Jeff Perry had the vision of establishing a Theatre Company. Together, the three established the Steppenwolf Theatre Company in 1974 and since its establishment, it has gone on to be a conveying vehicle, showcasing the talents of actors like John Mahoney, Laurie Metcalf, John Malkovich, Ethan Hawke, and a few others. As the owner of a Theatre Company, Gary Sinise had no trouble securing roles at the early stages of his career. He worked both as a director, producer, and actor. His hard work began to pay off at his production of True West in 1982 which was recognized with an Obie Award. The following year, he starred in his first film, Miles from Home, directing and acting in the film. Since his debut, he has starred in 29 films till date, appearing in notable films like Forrest Gump, The Green Mile, and Apollo 13 alongside Tom Hanks. Other films of note include Mission to Mars, Ransom, The Stand and a few others. Currently more active in Television, Sinise made his television debut in 1980, starring in an episode of Knots Landing. He kept his Television appearances limited to guest appearances until 2004 when he started appearing on CSI: New York as Detective Mac Taylor. He starred in all 197 episodes. Since then he has committed to other Television projects like being the narrator for three Documentary miniseries and starring in Criminal Minds: Beyond Borders. Outside Acting, Gary Sinise is a musician. He plays the bass guitar for Lt. Dan Band, alongside Kimo Williams, Carol Williams and Danny Gottlieb. He is also a model for Baume & Mercier watches. Known as a notable philanthropist, Gary Sinise began his charitable life, co-founding Operation Iraqi Children, a program that was designed to send school supplies to Iraqi Children. He has been nominated for 19 Awards in his professional career and has won a total of 11 which includes the SAG Award and Golden Globe Award. Was He in the Military? Gary Sinise was never in the military. He did, however, play a military man in Forrest Gump, an experience he attributes to his love for the military. He has shown this love in various ways including through music. He has also been honored with awards such as being named as an honorary Marine, Master Chief Petty Officer of the Navy among others. Being a big fan of the military, he is a supporter of various veteran organizations and has received several honors by different branches of the United States military in recognition of his support for military veterans. His band Lt. Dan Band regularly performs on United Service Organization (USO) tours at various military bases around the world. In December 2018, through the Gary Sinise Foundation, he paid for 1750 children of servicemen and women who have lost parents to visit Disney World. As a part owner of a successful theatre company and producer of several film and television projects, Gary Sinise has been able to accrue a net worth of $40 million. Even more interesting is the fact that he does not hold back when it comes to spending any part of that net worth on the disadvantaged in the society. 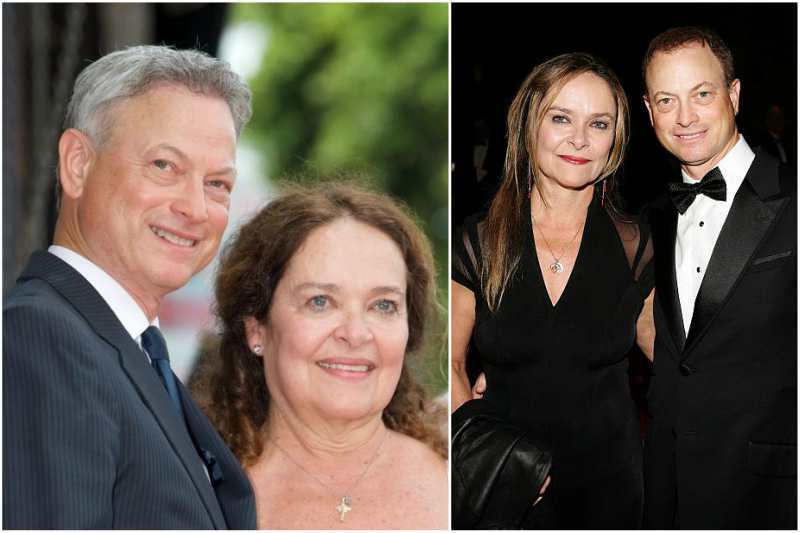 Gary Sinise has been married to his wife, Moira Harris since 1981. Moira is an actress who starred in Of Mice and Men alongside her husband Gary and in Terminator 3: Rise of the Machines. She does not have a whole lot of movies to her credit, but theirs has been praised as one of the most successful marriages in the entertainment industry seeing as they are still going strong. The couple has three children together – Sophie born in 1988, McCanna Anthony born in 1990, and Ella born in 1992. Sinise has created a legacy that can be looked up to by many; a life worthy of emulation in service of mankind but has a body height that pales in comparison to his legacy. He stands at just 5 feet and 8 inches and weighs 75kg. He has grey hair and green eyes.